Advantages: Crisp resin parts; colourful and unusual subjects; well printed and in register; good colour instructions; high quality presentation. 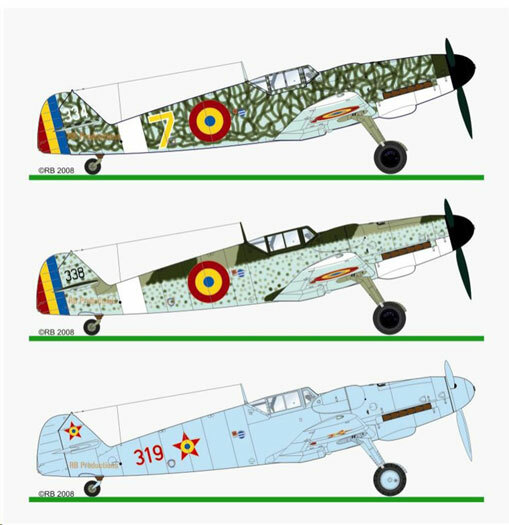 This decal sheet by RB Decals is a fine quality decal sheet depicting the IAR Brasov Messerschmitt 109Ga-6 in Romanian service. The decals are available in 1/32, 1/48, and 1/72 scale. The decals are printed by Fantasy Printshop for RB Decals. The decals are superbly printed with good colour saturation and register. The carrier film is ultra thin and my experience with Fantasy Printshop in the past has been that they have to be handled carefully and snuggle down into the surface detail well. The carrier film then almost totally disappears under a coat of clear. Radu Brinzan has done a superb job of the decal artwork and the instruction sheet artwork. Also included are a set of superbly cast resin engine gun bulges to convert the kit to the IAR design. The bulges on the Romanian 109 are similar to the German G-6 but are more elongated stretching back towards the windscreen. These are a simple replacement for the Hasegawa kits. The instructions also give some good detail colours for the subject aircraft. Decals are provided for three schemes. IAR Bf 109 Ga-6 “334” Yellow 7” of Flotilla 1 Vanatoare Popesti Leordeni flown by Lt. Av. Tulbure Gheorghe in April 1949. This aircraft is finished in overall Light Blue similar to RLM 65 with the upper surface covered in a dense wavy pattern of Dark Green similar to RLM 71. The wing tips, lower engine cowl, and fuselage band are finished in white. The spinner is black while the rudder is finished in red, yellow and blue. IAR Bf 109 Ga-6 “338” of Flotilla 1 Vanatoare Popesti Leordeni flown by Lt. Av. Fotescu Constantin in 1949. This aircraft is finished in Light Blue similar to RLM 65 on the under surfaces while the upper surfaces are finished in a splinter pattern of Dark Green similar to RLM 71 and light grey similar to RLM 02. The fuselage sides have a dense pattern of small mottles of the two upper surface colours. The wing tips, lower engine cowl, and fuselage band are finished in white. The spinner is black while the rudder is finished in red, yellow and blue. IAR Bf 109 Ga-6 “319” of Regimentul 180 Rosiori flown by Lt. Av. Bores Constantin in July 1952. This aircraft is finished in overall Russian light Blue including the props and spinner.